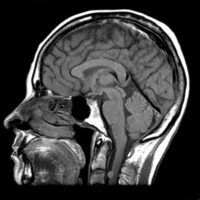 post operative follow-up after brain surgery. the patient has/wears a pacemaker, metallic tubes or any other metallic objects fixed in the body (especially at the eye level), metallic heart valves, metallic clips at the head level, metallic implants in the ear, medical dental prosthesis (e.g. the injectometre pump). For patients wearing metallic dental prosthesis, stants, etc it is very important that the doctor who requires the investigation should mention if the materials they are made of are compatible with MRI. Relative contraindications: claustrophobia, intrauterine devices, permanent tattoos, osteosynthesis materials, prosthesis (screws, rods, knee and hip prosthesis)..